The car came with a 302 out of a 74 maverick (we think from the numbers). It ran, but was puffing a little smoke. So hubby got to tearing into it. This is looking down into the intake. We're thinking this isn't good. lol. 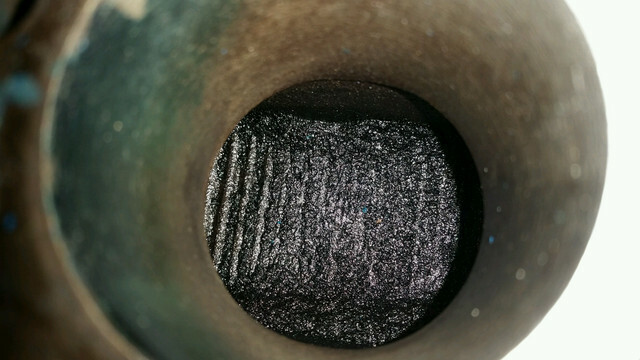 Is there a way to clean, or are we looking at a new intake? In my opinion, I would just go to summit racing and pick up an edelbrock Performer intake and a 600 cfm edelbrock carb and never look back. Or get on craigslist or ebay to save some money on a used intake but I would buy a new carb. Nice 4 barrel on there would be great! If you really need to clean that carbon build up inside the manifold, pick up several cans of SeaFoam. Keep adding it to the fuel tank for several tanks full.. Pull the carburetor after that and inspect the inside of the manifold.. You should see signs of the carbon having been removed.. Unfortunately, this will not cure the problem. Based on your description, the puffing of smoke is due to worn valve stem seals (firstly), or oil ring blow by from the pistons.. The PCV system is designed to pull these oil vapors thru the intake manifold and burn them. That's the black build up visible on the inside. +1 a new 4bbl carb and intake would make a nice upgrade. +2, Ditch the stock intake for a nice aluminium intake and 500-600 cfm carb of your choice. Gain a little power and drop some weight at the same time, win win. Or get a few cans of brake cleaner and a box of shop towels and have at it. (03-03-2017, 10:34 AM)Mikes73 Wrote: +2, Ditch the stock intake for a nice aluminium intake and 500-600 cfm carb of your choice. Gain a little power and drop some weight at the same time, win win. Or get a few cans of brake cleaner and a box of shop towels and have at it. But you don't want to use too much brake clean and have the excess run down into the cylinders. That would wash the cylinder walls and rings of the oil. 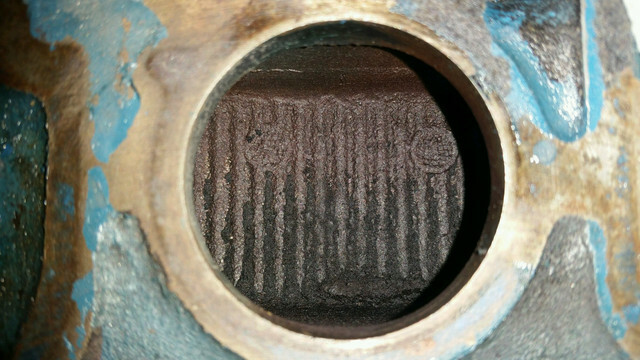 May score a cylinder with a dry cylinder and debris that the brake clean would wash down into the cylinder. you guys are great at spending someone's money... lol. checking into intakes and carbs. lol.. I'm NO engine expert, but from what little I do know, I think a top end clean-up is in order. It could just be in need of new valve stem seals which can be done on the engine without removing the heads. (By someone who knows how to do it) It might be necessary to pull the intake and do it properly if you are concerned about the carbon build up. OR Hubby could go all the way and get the heads redone at the same time. A performer intake around $220?? 600 cfm carb around $325? So about $550-600 you could do the upgrade.... probably cheaper if you search around or get a used intake. It's not possible to get that gunk out with the manifold on the car. If the gunk is not removed it can start flaking loose, causing additional internal damage. The only way to get it all removed is to have it hot tanked. The issue that caused the problem has to be addressed, or the new manifold will eventually look the same.